Welcome to Heat Shrink Tubing Direct! Welcome to HeatShrinkTubingDirect.com, your one-stop online source for superior quality heat shrink tubing products and accessories! At Heat Shrink Tubing Direct we specialize in providing the best selection of versatile, highly reliable, and customizable heat shrink tube solutions available anywhere. We carry a full line of shrink tubing including polyolefin tubing and adhesive lined tubing, to clear plastic tube, and PVC tubing. Each of our different types of heat shrink tubing has different strengths, temperature requirements, and resistances. Most of the tubing is resistant to fuel and alkalis, some are even resistant to acids. Please make sure to view our Heat Shrink Tubing Selection Guide to view all the specifications of our available heat shrink tubing. 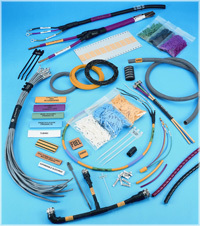 At Heat Shrink Tubing Direct, we also have a full line of related accessories and tools available to make your projects hassle free as possible. Did you know that heat shrink tubing is a great way to identify wires, cables and other items? We recently added 3MTM's line of portable label printers that allow you to create custom heat shrink wire marking labels at the palm of your hand! Looking for a certain type of heat shrink sleeve or need more information/specifications on any particular heat shrink tube product? Just pick up the phone and call us toll-free at 800-491-2816, our knowledgeable and experienced shrink tubing experts are always here to help! Our vast heat shrinkable tubing inventory remains fully stocked at all times, ensuring that we always have the products and materials that every customer needs to meet the requirements of any project. Place your order today for immediate shipping! Personalize your heat shrink tubing with our professional custom printing and cutting services available with all of our tubing products! With our state-of-the-art high-speed printing and heat shrinkable tubing cutting equipment, we can custom cut and print your company logo, barcode, specifications, and other identification information onto virtually any shrink tube product. Both low and high volume heat shrink sleeving requirements can be easily accommodated. We provide same-day samples: send us your artwork and we'll make up samples that day! Custom imprinting of graphics, logos, barcodes, serial numbers & text using thermal & hot-stamp print technologies onto any tubing product. 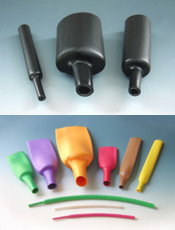 Choose the type of shrink tubing needed for your specific projects and applications: single-wall, dual-wall, desired shrink ration, colors, length, etc. We can also print on specialty heat shrink sleeve materials such as Neoprene, Viton® and more! Our custom printed tubing meets Military mark permanence test MIL-M-81531. Custom Printed Heat Shrink Tubing!